All I can say is, YOWZA, there has been a lot of Kaizen going on in Learning Rebel “land”. To refresh your memory, Kaizen is Japanese for “improvement” or “change for the best”, referring to philosophy or practices that focus upon continuous improvement. Kaizen may be an understatement for all that has happened to this Learning Rebel during the past year. Let’s count the ways, shall we? Being laid-off from my daily corporate gig. Changing, updating, changing again, my LinkedIn profile and resume to better reflect I was in the market – and wouldn’t having me on your team be a big asset? Going through the grieving process of losing one’s job, i.e. identity, and then having the realization dawn on you that you are not as in demand as one would have thought or anticipated – the need to change my career trajectory was upon me. Changing Learning Rebels from the little blog that could, to the Performance Consultancy site it needed to be. Changing it again, this time accepting that I couldn’t do it myself and hiring the best to help me get my thoughts together. Thank you Brian. Deciding on a focus then tweaking the focus, Learning Rebels is about “Fighting the Good Fight”. What better image than boxing gloves? Thank you Kevin. Changing, refining, how I view myself, my philosophy and my brand. Also harder than one thinks. If all of this seems overwhelming, it’s because it is. Hugely overwhelming and to be honest, there were times I wanted to pack it in and see how long I could live on the insulting amount of money the government gives you via unemployment. But because 2014 was the year of “Kaizen”, I made a decision to take a look at what I was doing and make improvements. We have all been in a place where we find our days routine and without challenge; those days where we are so overwhelmed by it all that we retreat. When overly stressed, most people naturally regress to an area of their lives that provides sanctuary. Turning us all into zombies. There it is. The zombie reference. How did I get from Kaizen to zombies? Well, I have to thank Urbie Delgado. He left this comment on my post “Looking Up”. On his blog, Connect the Dots, he posted a different perspective on “Looking Up“, but to me what shouted out was the zombie reference in the comment. My initial research of Zombies gives me this description of a “Walking Zombie”: Not a large threat alone. But in a group they can be a massive threat to survivors. z’s have a movement of a shambling limp, moving at a low speed. This may cause survivors to see them as easy to avoid, although this will cause them to rush headlong into a situation, allowing biters to move in behind them and box them into a corner or other z’s. Condemning them to death if they do not analyze what they are doing. They also exhibit these characteristics: (via Wikipedia) I could not help but notice the similarities between the fictional zombie and real humans in Learning and Development. Mobile (able to move) but technically dead, without a heartbeat or other vital signs: i.e. the bobble-head instructional designer. In a decaying (rotting) state, with discolored skin and eyes: The elearning developer stripped of the creative side of their brain staring forlornly at their securely locked computer screen. Non-communicative (groaning and howling instead of speaking): The instructional designer after endless, non-productive meetings with Subject Matter Experts using War and Peace as resource documents. Unemotional, with no mercy toward victims: The Learning Professional with the “crank it out now and fast” attitude. Everything must be measured, everything must be controlled with no regard to performance outcomes. Vulnerable to destruction of the brain, which kills them: Sitting at a cube and/or desk for so long without contact with real people has melted their brain, distorting their point of view. Contagious: a person that is bitten by a zombie will become a zombie: Misery loves company, as does the uninformed. Does not attack other zombies, leading to swarms of zombies: BEWARE! The zombie mindset is contagious. This where the practice of “Kaizen”comes to the rescue. When focusing on Kaizen, continuous improvement becomes a priority, and then it is impossible to turn into a zombie. We are keeping our brains sharp, mobile and agile. We are not letting uninspired ideas grab hold and take shape. We are thinking about what is better for the workplace environment and its people rather than allowing ourselves to be beaten down and have our brains eaten. 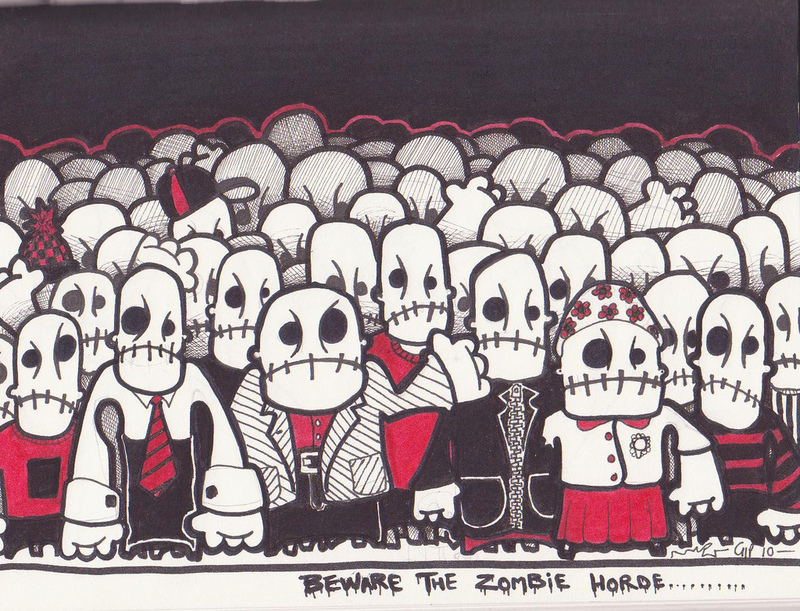 It is easy to find ourselves in the walking hordes of the dead or the dead-like. I see them at conferences all the time, hordes of zombies go in and hordes of zombies come out. What is even more troublesome is that sometimes it’s not the same people – somewhere along the line good people have turned into zombies. They got infected within our own sacred walls. The HORROR. Here’s a small Kaizen idea for conferences, specifically those on the selection committee – stop accepting presentations about work we all know has been debunked or whose theory is in question. Just stop it. We are turning our young ones into zombies. 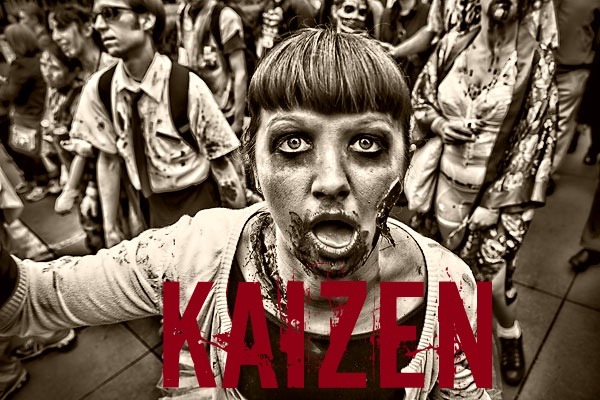 The question becomes how do we change from “zombie-like” to “Kaizen-aware”? This is a question I continue to ask even of myself. to keep up with the L&D brain trust – it’s easy to let your brain turn to mush. I could feel it happening to me too (and I work from home, I blame the zombie dogs). No one is exempt. One day your brain is fired up, colorful and imaginative – the next it’s being eaten by subject matter experts and others who have long given up ownership of their own gray matter. Therefore, I call for a continuation of the “Year of Kaizen”. There is still a lot of work to be done. A lot of changes that need to be made – and first we need to recognize that zombies are trying to trample all over us – they are trying to eat our brains. We must also be just as aware of zombies in disguise who are trying to force feed ideas and thoughts, they know we are weak, susceptible and busy. It’s the perfect environment for a zombie feeding frenzy. These zombies know we are looking for new ways to work and for $19.95 they will install the Google machine on your computer. Wake up and be alert! Want to start the year off right? Read ” John Medina’s book, Brain Rules,” about how the brain sciences might influence the way we teach and the way we work. There’s your Kaizen, 12 step list, for improving the way you design your learning. Bring the “Year of Kaizen” to your office, to your research, to your next project, to your mindset. Little changes add up to big solutions and better awareness. Learning Rebels goal for 2015? Continue to make small adjustments. For this I ask your patience. I am not a zombie, because of this you may notice changes in this website or other areas of Learning Rebels. The goal is to build a Learning “Rebel Alliance” (special shout out to Mark Sheppard, @marklearns, for coining the term). We are all in this together and it’s together, through Kaizen, that we beat back the zombie hordes and reclaim our brains. To continue to move down the Learning Rebels Kaizen path, (and not have the “Rebel Alliance” turn into a zombie horde), I ask for your help and to share your thoughts with me. What would you like to see more of in 2015? Thought pieces? Tips? Tackling specific categories such as: Elearning, Adult Learning, Social Media, Branding/Marketing? Together let’s share thoughts which are not only important, but are also critically relevant to you – the Rebel Alliance. Then: Share this post, let’s build our Rebellion together. Let’s gather, let’s share, let’s be vocal. Share with other L&D people, subject matter experts, your boss, share with zombies who still have a spark of life left in their eyes. Let’s be the change we want to see. Lastly: Sign up for the newsletter. The newsletter is a new addition to building our Rebellion. The newsletter will contain links and other “thinking out loud” pieces for you to share with others which, due to space, did not make to the blog. The newsletter is the easiest way for all of us to share the Learning Rebel message – you get an email, you forward an email to interested parties. Sharing done. To quote Home Depot – “Let’s Do This!” Rebel against the status quo, get your learning curiosity groove on, and let’s not allow the zombies to eat any more brain cells. Here’s to 2015 and the Rebel Alliance! I think what makes it so hard for me is that I’m trying to figure out how to fit this all in with my day to day office job. I am lucky that my work provides me an hour a day to work on this stuff but find myself putting in countless hours outside the office to figure it all out. Despite this – I have found the whole thing worth it and it’s fun going against the grain. Thanks for all your inspiration and support. Love your stuff! The next step is to test the reaction, plan for your defense, have your champion in place; and once you have that success under your belt, move on. As those success stories mount, your perception within the organization becomes more positive as it’s built on trust. 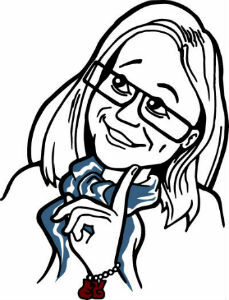 About the personal branding and PKM – it does take time to find your groove. So question about that, and what I find they both require constant attention. My advice is plan your day to incorporate nurturing your PKM. Set a meeting time with yourself and hold it dear. You would break a meeting with your manager, right? Treat with that level of importance and you will find a routine that best fits for you. Good luck to you Kate, thank you for reading – I’m glad I can inspire! Please keep sharing your stories, it’s how we all learn from each other (love your blog BTW!). I’m proud to be part of your team as you continue along this journey. Life in perpetual beta, right? I appreciate you sharing your work and your experiences. My commitment for 2015: writing more about projects like this website and sharing what I’ve learned and my clients have learned through the process, so we can all be better for it, and others can learn and know they have support if they want to buck the system. Best of luck in this coming year, Shannon. I look forward to both the small tweaks and the larger strategic decisions. Cheers! Thanks for the mention, Shannon! In this post I saw some reflections of the L&D person I used to be, particularly when I was in the external consulting business. “Zombie” is such an excellent way to describe the pre-programmed, “build-what-they-paid-for-not-what-they-need” mindset demonstrated by some providers. That wasn’t who I wanted to be and thus began my own little rebellion. Thank you Mark! That is exactly the type of behavior, the “‘build-what-they-paid-for-not-what-they-need’ mindset”, that I don’t want to fall into – and like you said, it’s important to be very aware of it’s presence. Which is why I combine the terms Kaizen and zombie for 2015, if we don’t keep an eye on one, we become the other. And personally, I like my brain right where it is. Part of the zombie problem is they go quiet in between brain meals. Some thoughts on change, Kaizen, and doors (that inhibit change). Hi Urbie! Love it. Take away the doors away (at least the metaphorical kind anyway) to promote Kaizen. You can’t change what you don’t see or observe. No stealth zombies allowed. Thank you again for your comment which inspired this post. Just goes to show, a lot people don’t think comments are important or that the writer won’t care about their thoughts. Well they are, and I do. Keep it up. I will admit it. I’ve slowly and gradually been turning into a zombie. But no more! I’ve grabbed my light-sabre, gassed up my X-Wing Starfigher, and eaten my Cheerios. I’m ready to fight the good fight. I dedicate 2015 as my Year of My Kaizen. I WILL identify areas to improve. I WILL take steps to change. I WILL share with my PLN. I WILL learn and change and grow. Tricia – I’m with you! Packing up R2D2 to be tech support, and using Jaba the Hut as a decoy for any invading zombie hordes. We can do this together. I got your back and I’ll bring the pop-tarts! Welcome aboard the route to Kaizen. Thanks, Shannon. I look forward to a prosperous and (more importantly) happy new year for the Rebel Alliance! My thought: little changes are enough only if the changes are continuous; one small change is nothing compared to a thousand, each building and improving on what now is. One large change, if sustained, nurtured, and evolved, can also be effective. So I make this commitment for 2015 and the alliance: to better connect with the current thoughts and work of those in my #PLN and engage in constructive debate. To that end, I am adding feeds to my reading list (Rebels is already added) and commit to spending at least an hour, three days a week, reading from it. Tom – great comment. You are absolutely correct, and thank you for making the point. Key to Kaizen, is not only the awareness of the need for improvement but the continuation of improvement. This is achieved by little chunks, dare I say micro-change (ha) or big changes. Not unlike a plant, you can’t plant the seed and then hope it’ll take care of itself. Change requires attention and nurture. Regarding your commitment. Love! I’m going to take a lesson from you. I have tried to break my reading into the AM over coffee, but sometimes that doesn’t work and perhaps a new method is required. KAIZEN! Are you keeping your reading list in feedly?